NASA Astronaut Pamela Melroy is the last-ever female space shuttle commander. Astronaut Pamela Melroy, the last-ever female space shuttlecommander, is leaving NASA?s spaceflying ranks for a new career in privateindustry. Melroy is a veteran of three shuttle missions. On her thirdflight, the STS-120 flight of Discovery in 2007, she became the secondwoman to command a space shuttle - a role reserved for astronauts who havebeen trained as pilots, rather than mission specialists. Despite the significance of her achievement, Melroy said thedistinction wasn't a big deal for her. "It doesn?t mean anything in particular to me becauseI'm certainly not going to be the lastfemale commander of a spacecraft," Melroy, 48, told SPACE.com.She explained that female astronauts are still qualified to command the spacestation (which doesn't require astronauts to be pilots to command), and willlikely lead missions on NASA's future spacecraft, such as Orion, beingdeveloped now. "I'd like to see a woman command a mission toMars," she said. The first female shuttle pilot (and later commander) was Eileen Collins.She led the STS-93 mission in 1999, as well as the STS-114 mission in 2005,marking NASA?s first shuttle flight to follow the 2003 Columbia disaster. Sincethere are no pilots among the remaining 16 women in NASA's astronaut corps,there will be no chance for another woman to serveas commander of a space shuttle, as the shuttle fleet is due to be retiredin 2010, or shortly thereafter. "I've never been terribly comfortable with the idea ofbeing a role model," Melroy said.. "But if it provides theinspiration to young women to say, 'If she can do that, then I certainly could,'I feel very fortunate to have been in a position to represent that message." 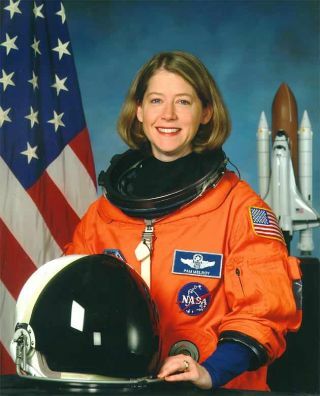 Melroy served as pilot on Discovery's STS-92 flight in 2000and Atlantis's STS-112 flight in 2002. After more than 14 years at NASA - shewas selected as an astronaut in 1994 - Melroy decided it was time for a change. "It was time for me to leave the astronaut office,there was no question about that," she said. "For my personal growthand development, it was time to move on and try new things and expand myhorizons a little bit." NASA announced Melroy?s decision to retire from theastronaut corps in late July. She is moving over to Lockheed Martin to take onthe post of deputy program manager for engineering in the space explorationinitiative. There Melroy will oversee the contracted work on the new Orion crewexploration vehicle, which NASA plans to use to fly humans to the moon andMars. "I'm very much in support of the Orion design and theOrion program," Melroy said. "I think it's time for us to get out oflow Earth orbit and Orion is going to take us there. We're ready to go themoon." Melroy already has experience with the program under herbelt: She has been serving as the branch chief in the NASA astronaut office forthe Orion project, coordinating astronauts' input into the operation and safetydesign features of the spacecraft. Despite her eagerness for the new opportunity, Melroy saidleaving NASA is bittersweet. "It's sad for a lot of different reasons," shesaid. "The same reason for how you felt when you graduated from college.You're sad to say goodbye, but you're very excited to start a new part of yourlife. That?s exactly how I feel. I've had a wonderful time and greatexperiences, and it's time to support other people now." Melroy was born in Palo Alto, Calif., and raised inRochester, New York. She is married to Douglas Hollett. She received her bachelor's degree in physics and astronomyfrom Wellesley College, and a master's degree in earth and planetary sciencesfrom the Massachusetts Institute of Technology. A retired colonel in the U.S.Air Force, Melroy is a test pilot and veteran of operations Just Cause andDesert Shield/Desert Storm, during? which she logged more than 200 combat and combat supporthours. Though there are many aspects of being an astronaut thatMelroy enjoyed, she will miss her fellow astronauts the most. "I'll probably miss the camaraderie," she said. "That?ssuch a pathetic word for such a strong experience. You get really close to thepeople you fly in space with. The astronaut office is a family." "As a classmate and a friend, I feel privileged to haveserved beside her," said NASA?s chief astronaut Steve Lindsey, head of theastronaut office at the agency?s Johnson Space Center in Houston. "We wishPam the best of luck in her new career - she will be missed." Lindsey credited Melroy?s work as commander of the STS-120trip to the International Space Station - which delivered a vital connectingmodule for new laboratories - for helping to pave the way for expanded crews ofsix to begin serving aboard the station this summer. During that mission,Melroy served alongside fellow NASA astronaut Peggy Whitson - the first womanever to command the space station - marking the first time two female spacecommanders led their respective missions at the same time. "Pam has performed superbly as an astronaut," hesaid. "She has flown three highly successful space shuttle missions andcontributed in several other technical areas during her 14 years of servicewith the astronaut office." For Melroy, there is no one moment that will stick out amongher cumulative 924 hours in space. "There are too many to count," she said. "Eachmission is totally unique in its experiences. You have tremendous highs fromeach and every one. I'd have to go back and say the thing that stands out isthe connection with your crew. The moments of laughter, the amazing things youshared that no one else will ever understand."